Working in the garage requires sufficient illumination in order for you to carry out your tasks effectively. 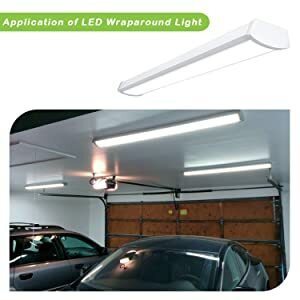 One of the best options for lighting you can look at is LED lights and we have decided to write extensively about the LED garage lights. We have also decided to review some of the best LED garage lights you could possibly find. 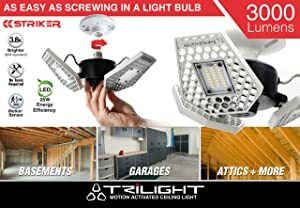 How To Use Garage Lighting Effectively and Safely? 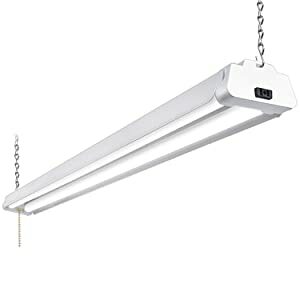 Hyperikon LED Shop Light, 4ft Utility Garage Light 40W. 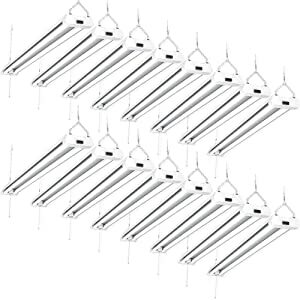 There are lots of LED garage lights to choose from in the market. Whilst most of them have similarities, most of them are very different from each other. 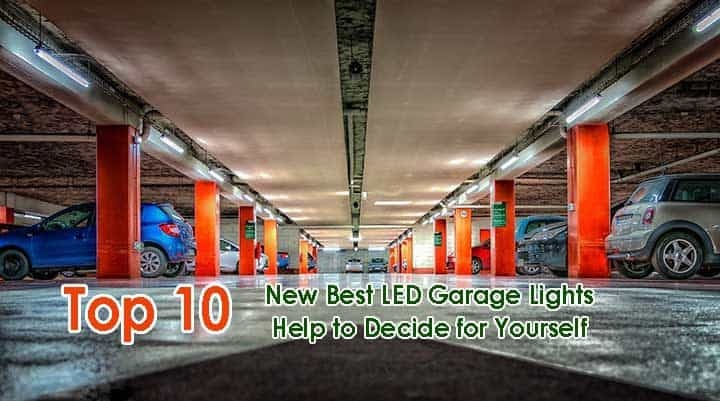 To ensure that you choose the best LED garage lights, we will be writing some useful tips to consider before making your purchase decision. One of the most important factors to consider before choosing a garage solar light is its brightness. This is because the major reason you are purchasing a garage LED light is to illuminate the area you need it for. Of what use will a dull light be to you? To be able to have an idea of how bright a light is, you have to look at its lumen rating. The higher the lumen count, the brighter the light will be. Often times than not, a LED light with a total lumen output of 3500 will be sufficient for your garage. However, you have to ensure that you are purchasing the light from a trusted manufacturer because some can lie about it. The colour temperature of the light is also an important factor that should not be overlooked. Because most garage light users prefer their light to be warm and feel like it is daytime even when it is nighttime. The warmness of a LED light is measured in Kelvin and to get the daytime feel, ensure you choose a light with lower Kelvin rating. LED garage lights are not always easy to install and users tend to incur additional costs by employing the services of those with the technical know-how. To eliminate these expenses, ensure that that you select garage LED light that you can easily install by yourself. Sometimes, the light of LED bulbs can be very deceiving and if your work is colour sensitive like the painting of cars, then you have to consider CRI. To pick the best light with suitable CRI rating, buy garage LED lights with CRI over 80. This is because the higher the CRI, the less likely you will get deceived by the light. Nobody wants to purchase a product that will not stand the test of time and this also applies with garage LED lights. 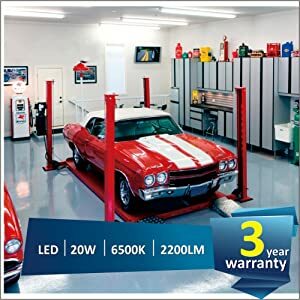 The life expectancy of garage LED lights are usually measured in hours and most of the lights have a life expectancy between 35,000 to 50,000 hours. This can be calculated to 10 to 20 years when used on an average of 7 hours per day. I think we can all agree that it is best to choose the LED lights with higher life expectancy. Garage LED lights can increase your electricity bill drastically and this is because they are always very bright. But, it is possible to pay less electricity bills without sacrificing the brightness of your light. This can only happen when you use energy saving garage LED lights. The efficiency rating of the lights varies with products and manufacturers but you can get lights with up to 70% efficiency or higher. Logically, it is advisable to purchase garage LED lights with a higher efficiency rating in order to save electricity costs. Read more: How to choose Best outdoor motion sensor lights? Without guidance, you can end up picking a LED garage light that you will regret purchasing. This is why we have taken our time to help you eliminate this problem by reviewing some of the best LED garage lights for you. Hyperikon is known to be one of the best companies when it comes to manufacturing of LED garage lights and the Hyperselect LED Shop Light shows this. With 3800 lumens brightness, you can tell that the light is impressive especially when you compare it with the price of the product. Speaking of price, you will find the Hyperselect LED Shop light to be quite affordable. In addition, instead of using the normal chain hanging system, the manufacturers made use of a wire suspension system. This suspension system has been judged by users and us as a better system. Installation of the Hyperselect LED Shop Light is also seamless although, some users could not set up the suspension cord well. In general, the suspension cord is flexible and it allows you to tweak the heights of the LED light as you like. As we know that no matter how good a product is, it often have its flaws too. The flaw of the LED light is the absence of a pull cord to turn on or off the light. The on/off knob of the light is placed where the power cord is and this makes it difficult to operate the light. Finally, the lights cannot be connected in series and this, in particular, is a turnoff for some people. The Barrina LED T5 is a bright light that with a total output of 2200 lumens. The light also consumes just 20 watts of energy which makes the light very efficient. To put this number in perspective, it means you will be saving at least 65% of electricity cost by using this light. 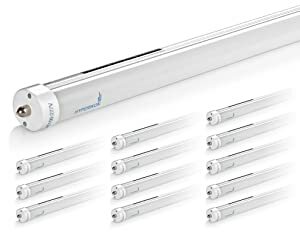 In the box of the LED light, you will find 6 pieces of the light, connectors and other necessary installation materials. The light also has a lifespan of 50,000 hours which can be calculated as 15 to 20 years of usage if the light is used on an average of 7 hours per day. Also, installation of the light can be considered as plug and play. This is because all you need is to hang the light with the accessories included in the package to get it started. 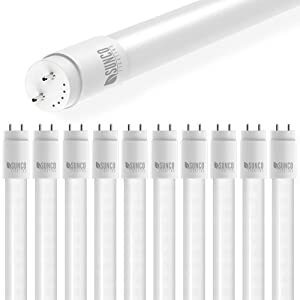 Furthermore, the light is linkable which means you can connect 6 tube lights in series with the connectors included in the package. Finally, the light has a 3-year warranty that allows you get a replacement if a quality issue arises before the expiry of the warranty. 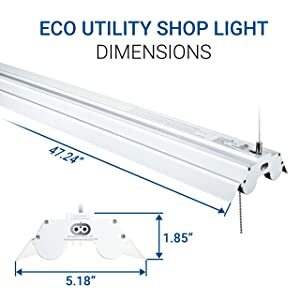 The hykolity 4Ft 42W Linkable LED Shop Light is a fantastic product that really deserves to be on this list. It has a total lumen output of 3700 lumens which we can all agree is very bright. Also, with a total energy consumption of 42 watts, the light is really efficient as you get to incur less electricity cost compared to the light you are getting. 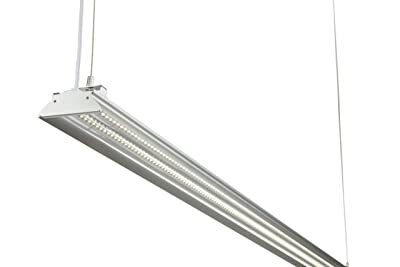 For durability, the fixture of the light is made with composite aluminium which also ensures that the light is not heavy. Furthermore, the installation of the light is very easy and all you have to do is mount it to hang from the ceiling. It also has a chain which allows you to adjust the height of the light to suit your preference. You also have the choice to discard the chain to install the light directly on your ceiling. Moreover, this light is ideal for those that want a LED light that looks like daylight. This is because the light has a colour temperature of 5000K. Finally, for quality assurance purpose, the manufacturers placed a 5-year warranty on the product. 4. 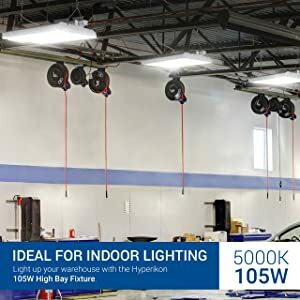 Hyperikon LED Shop Light, 4ft Utility Garage Light 40W. The LED light quality is often synonymous with the company manufacturing them. The Hypericon’s double fixture shop light is a reflection of the Hypericon Company. They are known over the years for quality which can be seen by their many energy certifications. In addition, their products are being used by companies that won’t compromise on quality. Some of the companies include; Google and Boeing. Speaking about the features of this product, the output of this LED light is 4000 lumens and impressively, it consumes only 40 watts. This is impressive because whilst the LED light is giving so much light, it is consuming less energy. In addition, the bulbs are also known to last for a very long time. This is because they have a standard life span of over 45,000 hours. This can be calculated to about 10 to 20-year lifespan depending on how you use them. Also, installation of the light was made easy and all you need to do is follow the installation guide included in the pack to set it up. In addition, you have a choice in the mounting of the fixture as you can choose to suspend or fixate it on the ceiling. Finally, it has a 5-year warranty which further assures you of the quality of what you are getting. The Sunco Lighting 16 Pack Led Light is a powerful light with 40 bulbs and an output of 4100 lumens. 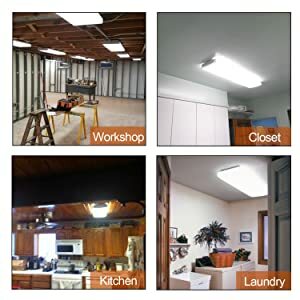 In addition, the light consumes a total of 40 watts which means that you are getting more light compared to the electricity you will be consuming. Also, it allows linking of up to lights together. This can be done by using connectors and by so doing, you get to conserve energy. 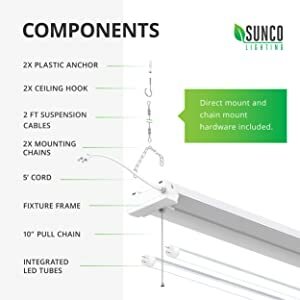 Installation of the Sunco LED light is also easy and all you need to do is follow the installation guide and it will be set up in minutes. Also, included in the box is the mounting hardware. To attest for optimal performance of the product, the products are ETL, energy star certified. Furthermore, the light has a 50,000-hour lifespan which can be averaged to 15 years of usage depending on how often it is used. The light is mercury and UV free which further makes it safer to use. Finally, the product has a 7-year warranty which at least gives the user a certain level of confidence when purchasing. Hykolity, as we know always reel out fantastic products and the Hykolity 4FT 36W Linkable LED Shop Light, is no different. It provides bright lights with an output of 3600 lumens and it is also very efficient because it consumes just 36 watts of energy. With this, you get to save at least 70% of your electricity charges. Also, the LED also has a 5000K light warmness which is quite like daylight. One good reason we like this light is that it is linkable. 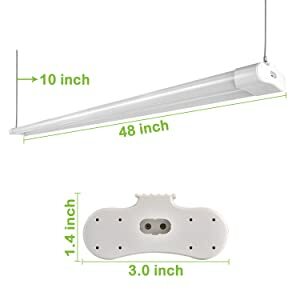 The light allows you to link 2 light fixture together with the connector included in the package. Also, you can install this LED light without employing the services of professionals. 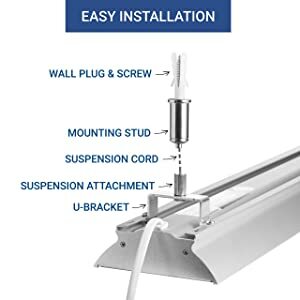 This is because the light package includes mounting hardware which can either be suspended or direct mounting hardware. The package also includes power cords with on and off switch to ease usage and installation. Furthermore, the light can be used in different places like garages, shops, warehouses, etc. The light also has a lifespan of 50,000 hours and to vouch for this, the manufacturers placed a 5-year warranty on it. The connectors to chain them aren’t strong. Hykolity never disappoints with their LED light products and their 4ft LED Wraparound Light is another impressive product from them. The light has an output of 4000 lumens which we can all agree that it is as bright as any light can be. The LED light is energy saving and you can rest assured that you are getting more light with less energy consumption hereby saving you electricity costs. 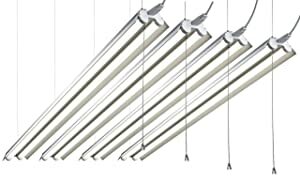 Durability is also one feature the Hykolity 4ft LED Wraparound Light as it has a lifespan of 50,000 hours. This can be converted to 18 years if the light is used 7 hours a day on average. It is also ETL certified which further gives you assurance on its quality. Furthermore, to further attest for the quality, the manufacturers placed a 5-year warranty on the product which means you have nothing to worry about at least, for five years. 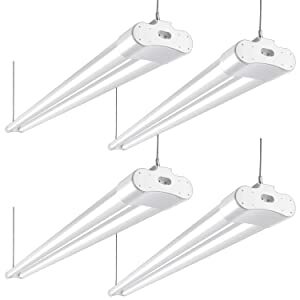 Also, installation is very easy as all you need to do is mount the lights on walls or ceilings. To make the installation easier, the manufacturers included the mounting hardware in the box hereby saving you further cost. Finally, the light is suitable for wide applications like offices, stairways and garages. You have to figure out how to mount the light yourself due to lack of manuals. 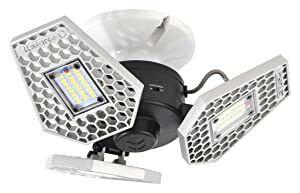 The Hyperikon LED 2FT High Bay Light Fixture is one of the good LED garage lights reeled out from the Hyperikon Company. This offers 14,000 lumens of light output which can be calculated as 130 lumens of light per watt. In addition, it has a 120-degree beam angle that promises to cover as much ground as possible. Also, the LED light is energy efficient which means that you will be paying less for energy in comparison to the light you will be getting. In addition, it has an effective motion sensor feature. This sensor works by turning on the light automatically when movement is detected. This means that regardless of you switching the light on or not, it will always come on when anybody is around. Also, the light has a lifespan of 45,000 hours which means that after the first purchase, you won't have any cause to repurchase for a long time. Furthermore, the light has a durable housing which ensures that your light won't fall apart easily. Finally, to attest for the durability of the product, the manufacturers placed a 5-year warranty on the product. 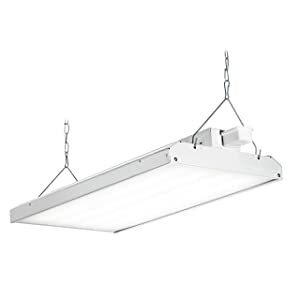 The AntLux 4ft LED Garage Shop Light Wraparound Light Fixture is very bright. It has a total lumen output of 5500 lumens with energy consumption of 50watt. This light is energy efficient and you are assured of saving at least 60% of electricity cost when using it. Also, with a 50,000-hour lifespan, you can rest assured that you will be using the light for at least 15 years without maintenance. One feature of this light which we do not like is the fact that you cannot dim the light. Which means that you cannot decide to choose whether you need bright lights or dim lights. Installation of the light is also very easy and you can decide whether you want to mount it directly or hand them using wires. Although, you have to ensure that you check the connectors properly to ensure that they are well secured. 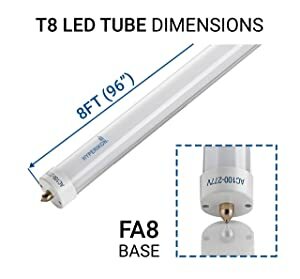 Like most of the LED lights we have reviewed, this light is also durable and this can be seen by it being ETL certified. Finally, the manufacturers offer a full replacement of the light if it has a quality issue within five years which further cements the confidence of potential users in the product. The frame isn’t very strong. 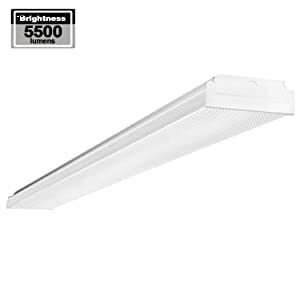 The striker Concepts 00342 Trilight Motion Activated Ceiling Light is an SGS certified product which shows that it is tested to ensure its safety for use. It has 3000 lumens output of light which is about 4 times brighter than a 60-watt bulb. In addition, the bulb is efficient as it only consumes 24 watts of power. This ensures that you pay less electricity bill for more light. The light is suitable for both indoors and outdoors as you can use them in basements or even inside workshops or garages. One good feature of this light is its microwave motion sensor. This works by automatically turning on the light when movement is detected around it. This is very good for security purpose because you get to spot intruders on time. Also, if you do not like the sensor mode, you can decide to turn it off. Furthermore, installation is very easy and you do not need the service of a professional to have it installed. All you need to do is take the light out of the box and screw it to your ceiling. Also, the LED light promises a 50,000-hour lifespan which can be calculated to about 15 years of light if it is used for 7+ hours daily. Finally, the light has a strong build and you can rest assured that you will use it for a long time. There are numerous LED light bulbs for garages available for purchase and you can end up making the wrong choice if you are not careful. To save you from this problem, we have decided to review 3 of the best LED light bulb for a garage for you below. 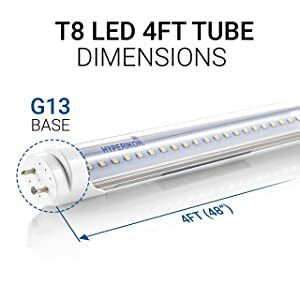 The Hyperikon T8 T10 T12 LED Light Tube is a very bright LED bulb for garages. It has a total lumen output of 2,360 and CRI rating of 85+. The high CRI rating means that the light will not change the colour of your surrounding making it a perfect light for colour sensitive jobs like car painting. Also, to further guaranty safety and quality, the light has gone through certifications and testing by the Underwriter Laboratories. After the testing and listing, the light was said to pass all the safety requirements. Furthermore, the light has a lifespan of 45,000 hours which means that you will get to use the light for a minimum of 15 years. This does not only eliminate the cost of having them replaced frequently but also eliminates the stress of installation. Installation of this light is also very easy and you do not require the help of electricians to set it up. Finally, the LED light has a 5-year warranty to assure the customers of the quality they are getting. 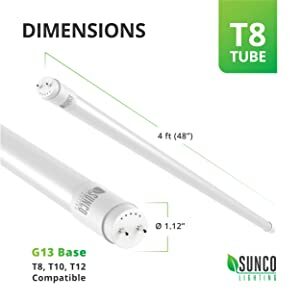 The Sunco Lighting 4FT T8 LED Tube is a 2 fluorescent tube light that does the work of 1 LED tube. It is suitable for both commercial and residential buildings. This light produces a total lumen output of 2200 which can be considered as not bright enough. But it covers for its non-brightness by being efficient and this is because the light only consumes 18W of energy. To put this in context, it means the light helps you save up to 80% of energy costs. The lifespan of the light is over 50,000 hours which means you do not have to change it frequently. Another good feature of this light is that it works perfectly even in cold weather conditions. The light is stable, it doesn’t flicker and it has a beam angle of 120 degrees. Also, the light has gone through tests which certified that it is safe for use and it emits no hazardous light. The colour of the temperature of the light is 5000K which makes the light give a daylight feel. Finally, the manufacturers offer a 5-year warranty on the product to boost the confidence of customers. With 4200 lumens of light output, we can agree that the Hyperikon T8 T10 T12 LED Tube light is extremely bright. Also, the light consumes just 36 watts of energy which is really impressive. 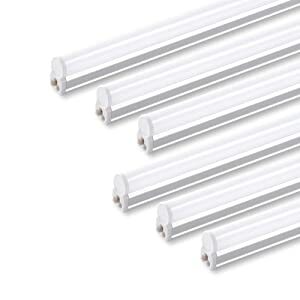 In addition, the tube lights are made shatterproof to increase their durability. Talking about durability, the light has a lifespan of over 45,000 hours which is about 20 years. With this light, you get to cut on maintenance costs and stress faced due to reinstalling lights. Furthermore, the light has a temperature colour of 6000K which makes the light look exactly like daylight. Installation of the lights is also easy and all you need to do is follow the installation manual included in the package. Finally, the light has a 5-year warranty which means that the manufacturers will replace the light for you if it has quality issues. We could not find any negative feature of the light as at the time of review. There are different types of lighting that can be used in the garage and they include fluorescent, halogen and LED. In the subsequent paragraphs, we will be writing about why you should dump every other type of light for LED lights. Led lights are known to last longer than the other types of light because they don't get burnt, their brightness just reduces by time. LED lights usually have a lifespan of 35,000 to 50,000 hours. In comparison, fluorescent lights rarely last for 10,000 hours while incandescent lights can last for a maximum of 1500 hours. Because of the long lasting feature of LED lights, you do not have to go through the stress of having to change your light frequently. LED lights consume less energy than normal fluorescent, incandescent and halogen lights. LED lights can effectively save you about 50% of your electricity bill compared to other types of light. LED lights have no filaments which mean they are not susceptible to break due to vibrations or other forces. In addition, LEDs do not have glass coverings which need to be handled with care. LEDs are rather mounted on circuit boards and well soldered to withstand impacts. 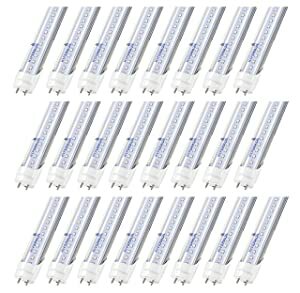 Fluorescent lights do not reach their maximum level of brightness when you turn them on and on average; it takes 2 minutes to reach full brightness. This isn’t the same with LED lights because it reaches its full capacity immediately you turn on the light. This is beneficial when you are in a hurry to turn on the light and get working. Garage led lights are usually heavier than normal lights because they are usually enforced with heavy steel casing. When installing the lights, ensure that they are not heavier than the mounting brackets. Although most LED garage lights come with their own mounting brackets which are deemed sufficient for them, you still have to test the weight to be sure. LED garage lights also tend to have pull chains for those that do not want to wire the power to a switch. In conclusion, ensure that the light balance well on the chain and ensure that the LED lights are not heavier than their mounting brackets. Ever wondered how to achieve good garage lighting? If yes, then you are in luck. Because below, we have written some few tips that will help you use garage lights safely and efficiently. Most garages are often very dark which makes working in there almost impossible. Whilst you can't buy garage lights that can cover the whole area of the garage, you can use a trick to get the best out of the lights you purchase. 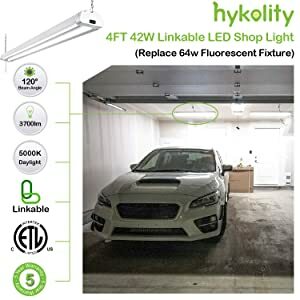 All you need to do is place the first garage light you purchase in the centre of your garage and then try to expand it from there. This is a common trick that helps you illuminate more ground compared to when you start by lighting up corners first. Ensure the mounting brackets are strong enough before you mount the garage lights on them. Also, make sure that you test the mounting brackets for impairment periodically to avoid them falling. When lighting your garage, ensure that the entryway is not left out too. This helps to eliminate the frustration of having to fumble with keys when you want to access the garage in the dark. It is also advisable for you to use lights with motion sensors in the entryway. As you know that the type of light you use in your garage can affect the quality of your work. This is why we have decided to pick some of the best LED garage lights and reviewed them for you. Whilst all the products we reviewed are of great quality, we can say that the Hyperikon Hyperselect LED Shop Light is the most astonishing out of them all. It has a lot of impressive features and some of them include; its 3800 lumens output of bright light, its durability and its adjustable suspension system. We totally vouch for this product as well as every other product reviewed on this list.